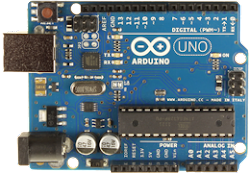 You can easily control your Arduino with an Android App Inventor App. Make a basic app, using the TinyWebDB in the Android App Inventor. If you specify the IP of the Arduino as a server, the Android app things it is storing values in a WebDB. But basically, it is just triggering a command on the Arduino. //Turn one of the LED's on, to know it is ready to go! //Make sure the power led stays on, when nothing happens. Very interesting project. If it isn't too much to ask, can you include a link with the app Invenntor code? Hi Antonio, sure I can! Import this project in your App inventor: https://docs.google.com/open?id=13G80qipX40PaMmMDtX2ft6X5kSFTltopZMag8SrWX-ezovhWmcegBli5Xs0L It is using GET-requests to trigger things on your Arduino. Hi! I'm trying to open the project in my App inventor but it's not working, the message that I get is: The selected project is not a project source file. Project source files are zip files...Any idea? Thank you!